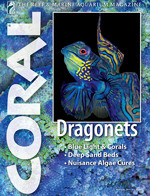 Your ads in CORAL Magazine reach exceptional audiences of involved aquarium enthusiasts. 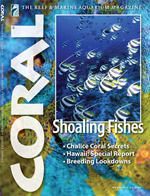 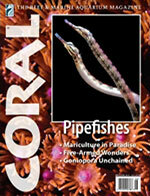 The world’s most popular and longest-running reef and marine aquarium magazine, CORAL provides wide-ranging, expert editorial coverage of reef fishes and invertebrates, aquarium system design and technology, explorations of wild reefs, profiles, interviews, and world-class color photography. 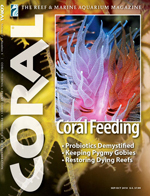 Lively, insightful, and on the cutting edge, CORAL is the definitive read in subject areas of interest for growing numbers of hobbyists and aquatic professionals who are passionate about their aquariums and keeping up with the latest information, products, and services.